Are you trying to make a difference on Instagram? Here’s a great article from Social Media Examiner on researching your competitors. 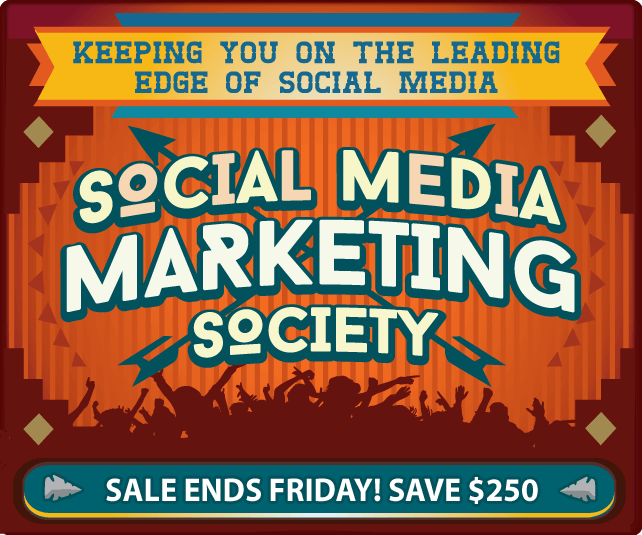 If you haven’t already, please subscribe to the feed on Social Media Examiner – great content! Wondering what your competitors are up to on Instagram? Looking for an enterprise-level tool to compare their marketing efforts to yours? Researching how your competitors market on Instagram can help you find new ways to reach your shared customer base. 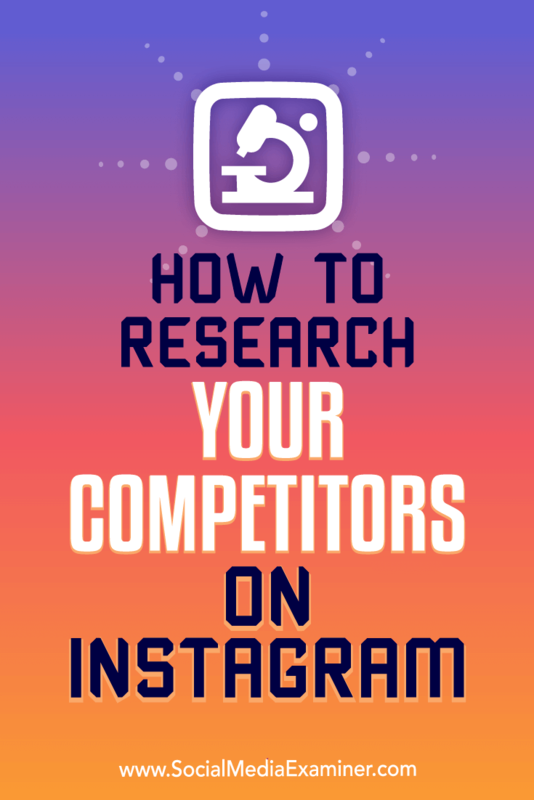 In this article, you’ll discover how to research your competitors on Instagram. How to Research Your Competitors on Instagram by Hiral Rana on Social Media Examiner. Disclaimer: This article discusses a tool that is costly and more suited to mid-sized and larger businesses. 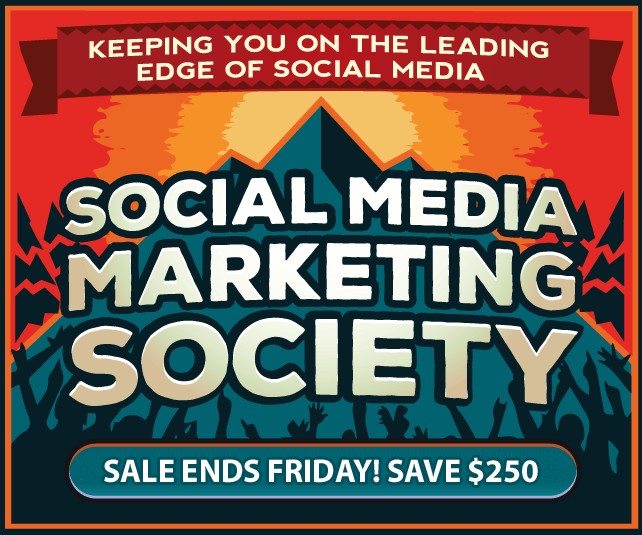 Social Media Examiner does not endorse this or any other product, tool or service mentioned in the articles we publish, nor were we, in any way, incentivized to produce this content. To create an effective social media marketing strategy, start by listening to what’s going on in your niche. These insights can help you pinpoint the most prevalent issues or concerns in your industry and then craft your messaging accordingly. When you’re always listening, you can jump on trends before your competitors. Talkwalker lets you do in-depth research on what everyone is buzzing about. Log in to Talkwalker and click the Analytics tab (the gateway to all of the social media insights you’ll ever need). 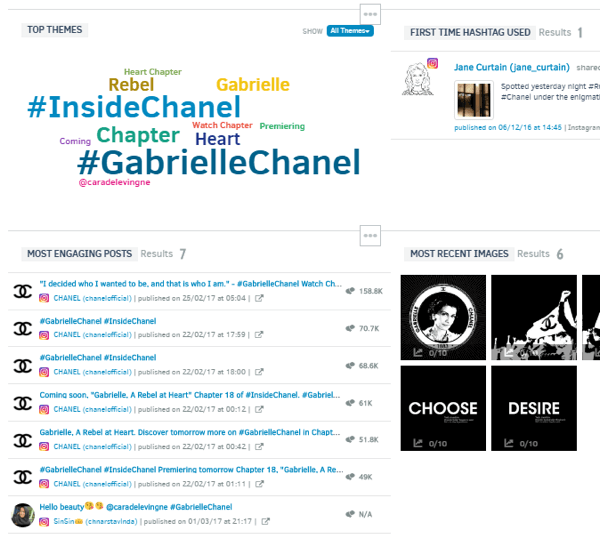 In the image below, I burrowed into Channels > Instagram and selected Chanel as an example. You can do the same for your competitors. In Talkwalker, go to Channels > Instagram to start researching your competitors. Click on Themes to get an idea of the rising, fading, and new themes in your industry. Think of this as a type of keyword research. You’ll want to build a decent-sized list of words around which you can create content. 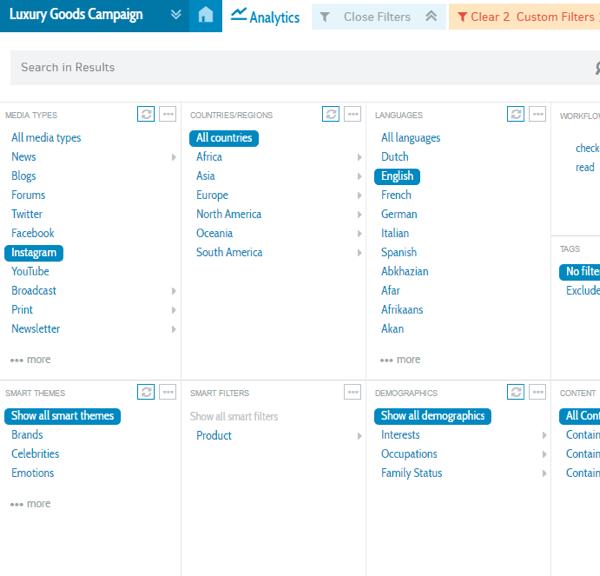 On Talkwalker’s Analytics tab, click Themes to see popular industry themes. Filter by hashtag to see the top Instagram hashtags related to this brand. To view popular Instagram hashtags with Talkwalker, filter by themes. 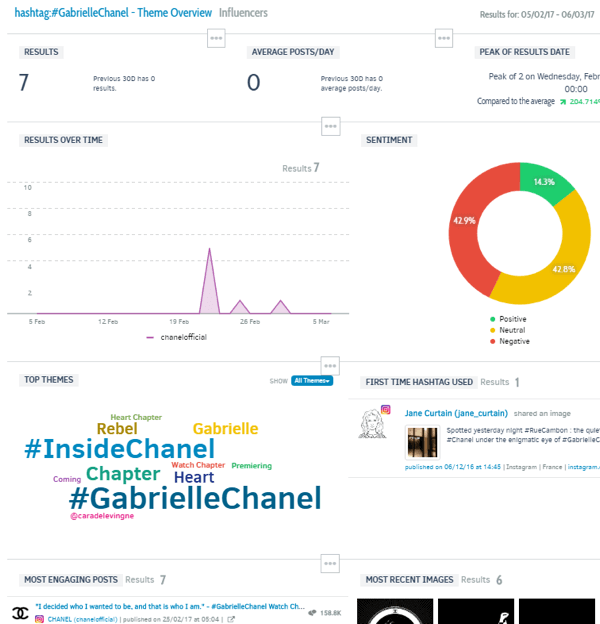 If you click on a hashtag (#GabrielleChanel, for example), you can get more in-depth information about it. Click an Instagram hashtag in Talkwalker to see more detailed information. Scroll down to the most engaging posts based on this hashtag to help pinpoint hot topics. You can also check Most Engaging Posts to see related hashtags. Scroll down to the most engaging Instagram posts to see which topics are resonating. 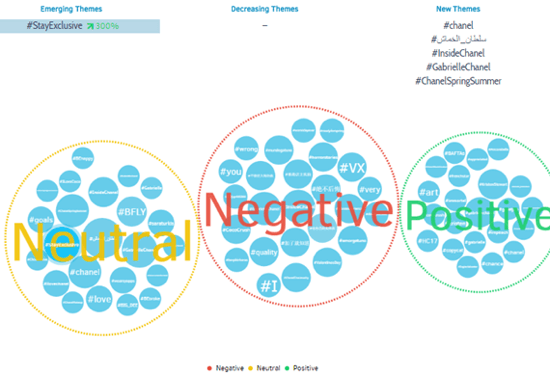 More importantly, you can view the sentiments around these hashtags. Click one of the sentiments in the pie chart to view more data. 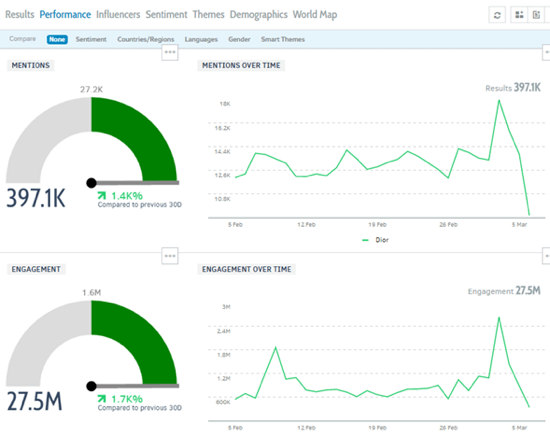 View more detailed information about hashtag sentiment in Talkwalker. These insights into popular hashtags and topics will inform your Instagram messaging to help you gain an advantage over your competition. 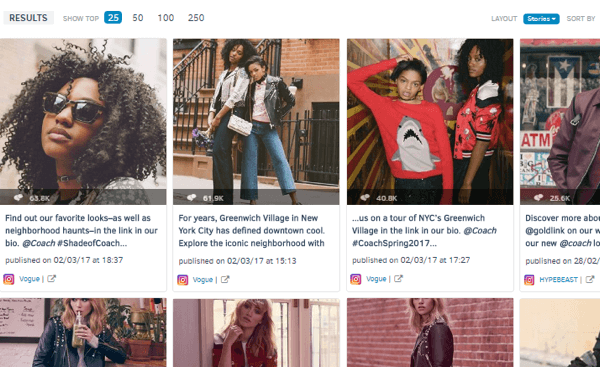 In addition to tracking trends and hot issues in your industry, you also need to know how well your competition is performing on Instagram. Talkwalker lets you compare your Instagram activity to your competitors’. Let’s take Coach, for example. The graph below is Coach’s Instagram activity for a one-week period. The graph lets you see how many times the company posted each day during that period. Talkwalker shows your competitor’s Instagram activity for the past week. Click on a date to see the posts and how much engagement (likes and comments) they received. You can also sort results by other metrics such as potential reach. Below the graph, Talkwalker ranks the most engaging posts over the selected timeframe. 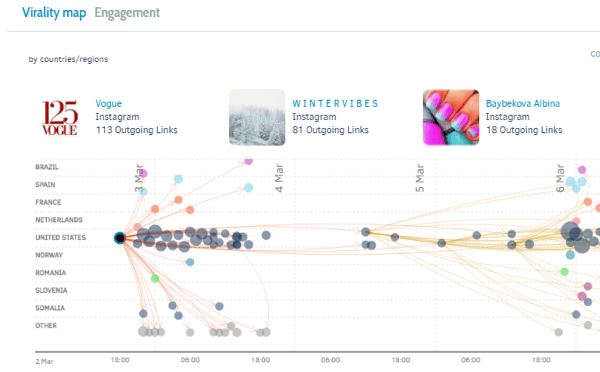 You can also see your competitor’s most engaging Instagram posts for the past week. Take a deeper look into your competitor’s most successful content. What are they doing well? What’s helping them attain high levels of engagement? For each mention, you’ll find a link to take you to the post on Instagram. There you can view the comments and find out what’s resonating with their audience. 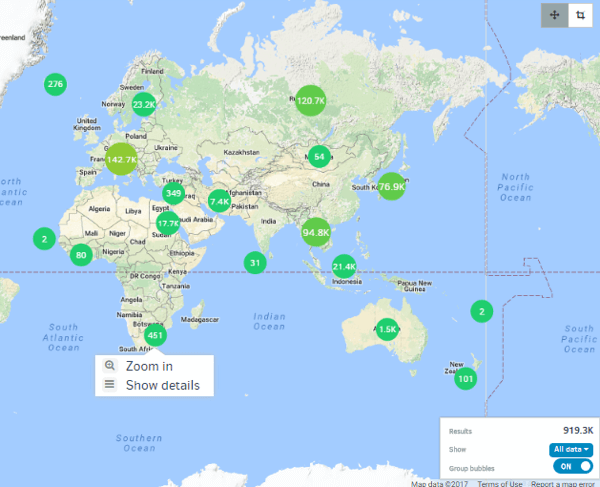 Take a look at Talkwalker’s virality map to see how your competitor’s posts spread across countries. Talkwalker’s virality map shows how posts spread across the globe. 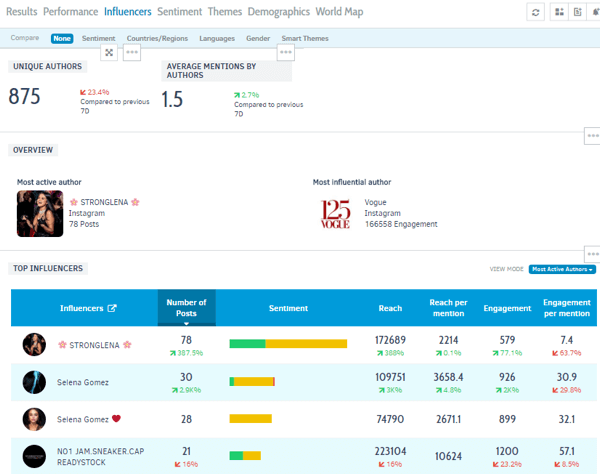 You can also view your competitor’s top influencers. Talkwalker identifies a brand’s top influencers on Instagram. Looking at your competitors’ brand advocates and Instagram content can help inform the direction of your campaigns going forward. Crafting successful brand messaging requires research and optimization. Talkwalker helps you identify optimal topics and times to post based on the probability to earn likes and comments. Let’s use Dior as an example. The graph below lets you see how active they were on Instagram over a specified timeframe. This type of data can inform which days and times are best for reaching a certain demographic. Viewing your competitor’s daily activity in Talkwalker can help you determine the best days and times to reach a particular audience. You can also analyze your competitor’s messaging on a more granular level. 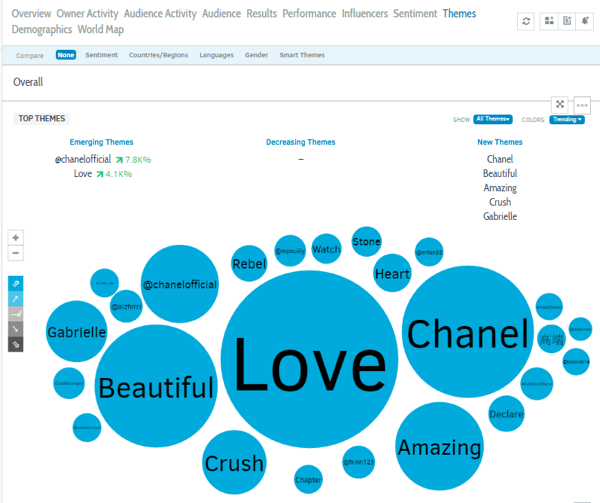 For instance, suppose you want to analyze how all of Dior’s English-speaking Instagram followers engage with the brand. At the top of the menu, choose Open Filters. Then select the filters you want to apply. Filter your results in Talkwalker to zero in on a particular audience segment. Filtering the data will give you a better feel for how involved these followers are with the brand. It’s a great way to pinpoint a single, focused demographic and their interests. You can then use these insights to optimize your own posts. 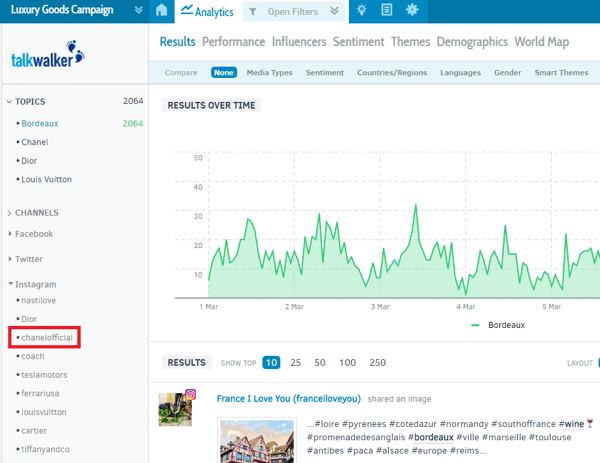 Click the Performance tab to get an overview of mentions, engagement, and reach for the brand over a given timeframe. Talkwalker’s Performance tab shows mentions, engagement, and reach over time. Talkwalker lets you put your competition under a microscope and learn how each post generates a particular reaction. From every post your competitor makes, you can get a better idea of how to tweak your own posts for optimal engagement. Establishing your company’s and competitors’ “share of voice” (share of the conversation) across Instagram will help you put your brand messaging in perspective. Typically you’ll examine these metrics over a longer timeframe to judge the overall success of a campaign. For example, let’s look at a comparison of Dior, Chanel, and Coach over a 30-day period. The chart below shows each company’s share of the conversation in relation to brand-consumer interactions. Chanel clearly has a significant share of voice over the other two brands. 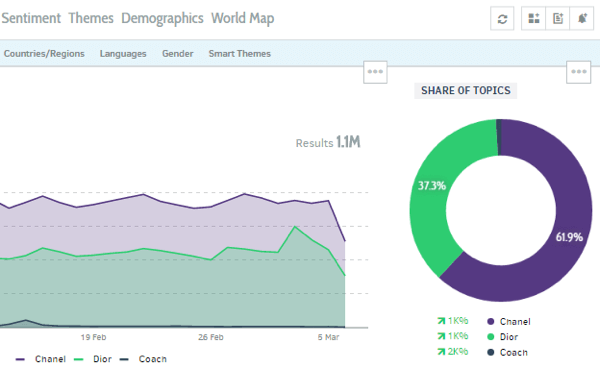 Compare brands in Talkwalker to see their share of the conversation on Instagram. You can look at each brand’s most frequently used hashtags. Compare the most frequently used hashtags for different brands. Talkwalker also provides a map to let you see where the mentions are coming from geographically. See where mentions are coming from on this Talkwalker map. Assessing your share of voice in the marketing landscape gives you an idea of where you stand in relation to the competition. This metric can be a key indicator that you need to improve how you relate to your target audience. But take the findings with a grain of salt. Incorporating visual-based Instagram into your marketing is all about showcasing your messaging through photos, videos, infographics, or memes while avoiding hard sales pitches. Use the tips above to gain insights that will help you stay ahead of the competition. What do you think? Have you tried Talkwalker? How do you gather insights about your competitors on Instagram? Please share your thoughts in the comments below.